From January2000 – December 2004 unselected consecutive non smoking candidates for day care LVHR were operated (general-anesthesia) by either IPOM( control) or IPOM+VOPCOD(study) according to informed consent based patient preference. A dual surface e-polytetrafluoroethylene prosthesis was used. Prospective Data-Day1 (D1), Day3 (D3), 3rd week (W3),3rd month (M3) & Year(Y) 1…9. Study (n=30) & Control (n=41) were well matched for demographic, co-morbidity & hernia content profile. There was no visceral injury, technical difficulty, conversion, any adverse event or failure to discharge from daycare. There was no loss in follow up. Recurrence None reported or clinically detected in either of the groups during a follow-up of 9 years (minimum being 5 years). 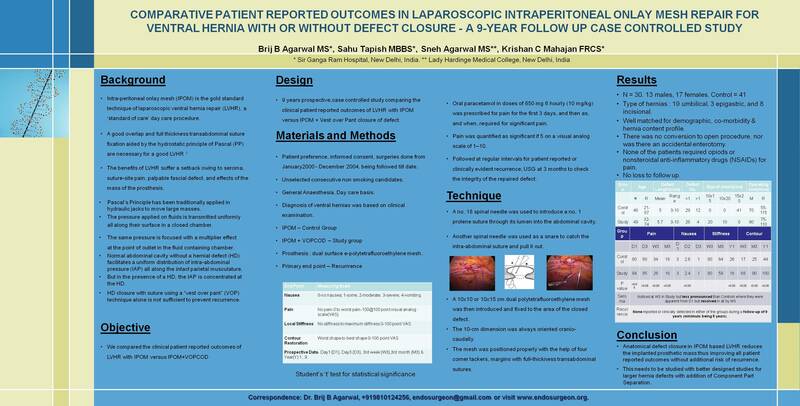 Anatomical defect closure in IPOM based LVHR reduces the implanted prosthetic mass thus improving all patient reported outcomes without additional risk of recurrence. This needs to be studied with better designed studies for larger hernia defects with addition of Component Part Separation.